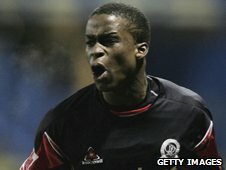 AFC Telford United have signed former QPR midfielder Stefan Bailey. The 22-year-old joins the Blue Square Bet North side on an initial one-month deal, with the option of an extension. "His desire is clear, but he wants to see how he copes with travelling from home down south," assistant boss Darren Read told BBC Radio Shropshire. Telford are continuing talks with the ex-Wolves striker Adam Proudlock, while full-back Will Salmon has extended his deal to the end of the season. Proudlock scored a first-half hat trick in their recent friendly win over Chasetown. Bailey played at Ebbsfleet in the Blue Square Premier last season and has also had spells at Grays Athletic and Oxford United. "Stefan's played at a decent level, and for one reason or another he's lost his way a bit," Bucks boss Andy Sinton added. "I have known about him for the last five years. He's strong, a good tackler and good on the ball." Bailey has been training with Luton under manager Richard Money, but now looks surplus to requirements.